Holliston Town Hall is located at 703 Washington Street, Holliston MA 01746; phone: 508-429-0601. 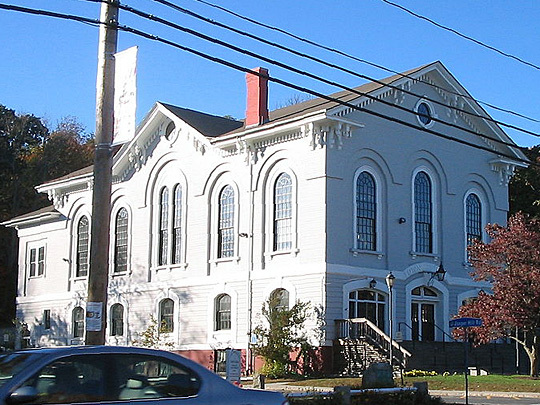 Photo: Holliston Town Hall, en.wikipedia.org, photographed by user:smc6287, October, 2006, accessed April, 2011. First settled about 1659, Holliston was incorporated in 1724. It was named for Thomas Hollis, an early benefactor of Harvard College. In the 1930s Holliston was still very much an agricultural community, surrounded by woods and meadows, though there were 2 shoe factories located here. Holliston was originally part of the Town of Sherborn and its territory was explored as early as 1659. There is no record of actual settlement within what would become Sherborn until after Sherborn's incorporation in 1674. The bill to incorporate the western part of Sherborn as a separate township was passed by the colonial legislature December 3, 1724. The first town meeting was held at the house of Timothy Leland at which 5 selectmen and other required offices were chosen. Samuel Adam Drake, editor, History of Middlesex County, Massachusetts, Volume I, Estes and Lauriat, Publishers, Boston, 1880.